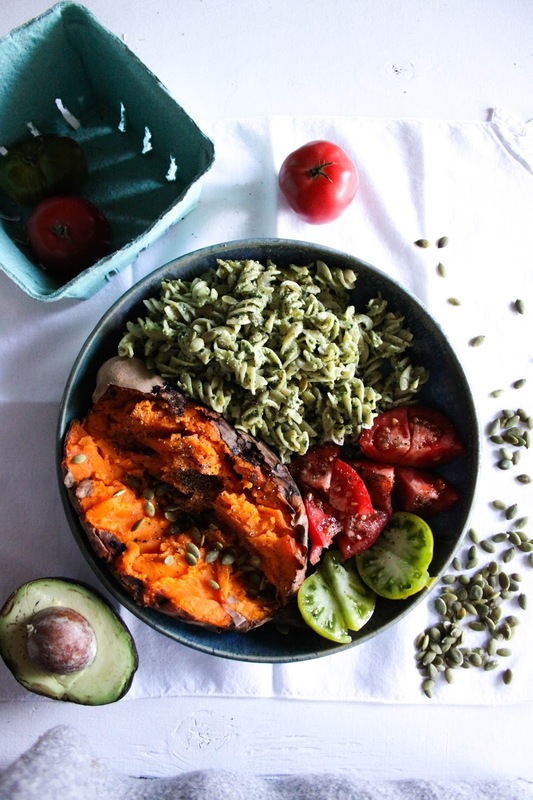 I called this The Glow Bowl because all the ingredients are superb for your skin so it's gonna make you glow from the inside out (sweet potatoes, greens, pumpkin seeds, and whole grain pasta - click the foods for their skin benefits!) But that awesome aspect aside, this recipe is so damn DELICIOUS I don't even care about the nutrition it gives me. I was shovelling this in my mouth in between gasps of pleasure and exclamations such as: "I CANNOT BELIEVE HOW YUMMY YOU ARE!" Seriously, I must have looked 100% nuts, but again, I don't care. This meal tasted perfect and that's all my mind - and mouth - could focus on while I devoured it. I have a little story to tell you now. I am the worst cook ever. Up until about two weeks ago, I didn't know how to bake a sweet potato. Not the right way, I mean. Sure, I steamed them. Sure, I would cut them up and throw 'em in the oven until they were edible. Sure, I thought they were okay. But I wasn't enlightened yet. I had no idea you could bake a sweet potato whole and end up with a creamy, steaming, bright orange inside under the skin and you didn't need to use any oil. I have no idea how I have been alive for 21 years and a foodie for several of those without knowing this paramountly important information. It's a mystery on the same level as stone henge. Then everything changed. A couple of weeks ago Jack and I went to have dinner at his parents house while his grandma was visiting. She is one amazing lady who isn't afraid to speak her mind and teach you a thing or two. Let's just say she's been around the block of life. She is a camp cook so she's used to making huge amounts of food for hungry men, and making delicious food at that. She also knows how to make the best veggie burger on Earth, FYI. She has been to a few vegan restaurants with me and Jack and absolutely LOVED the food every time. She is more than respectable of our choice to live vegan. So when we went over for dinner, she had already prepared a special meal for us: rice, salad and baked sweet potatoes. She had the sweet potatoes wrapped up in tinfoil so they stayed warm. When we sat down and I opened mine up, I couldn't believe it. The whole sweet potato was soft and creamy, I could tear it open with a butter knife! Most of you are probably sitting here thinking "Duh, whole baked sweet potatoes are the bomb - how could she not have KNOWN!?" *shrug* I have no good answer but what I DO know is that I wanted to eat all three sweet potatoes she had baked (oh wait, I did), and I definitely stole most of Jack's. I asked her for the recipe, thinking it must be some complicated process only the best chefs understand. She said: "I just throw 'em in the oven at 450 until they're soft. No oil or anything." JAW DROP. Okay I could go on and on about how amazed I was and how joyous the rest of my baked sweet potato-filled life will be, but you get the gist. Baking a sweet potato whole in the oven has rocked my world, and I am forever grateful to Shirley for showing me the beta carotene light. To make the main stuff: preheat the oven to 450 degrees. Wash, scrub and dry the sweet potato, then poke holes in it with a fork. Set it on a baking sheet lined with tin foil and bake for 30 minutes, flip it over and bake for another 30 or so (although if your sweet potato is smaller you might just need the first 30 minutes). UPDATE: this actually works just fine if you have the oven at 350, and you don't HAVE to poke holes in the sweet potato or have it on tinfoil. Press it with a fork and make sure it's soft all the way through. Wrap in tinfoil and set aside. Cook the pasta according to directions on package. 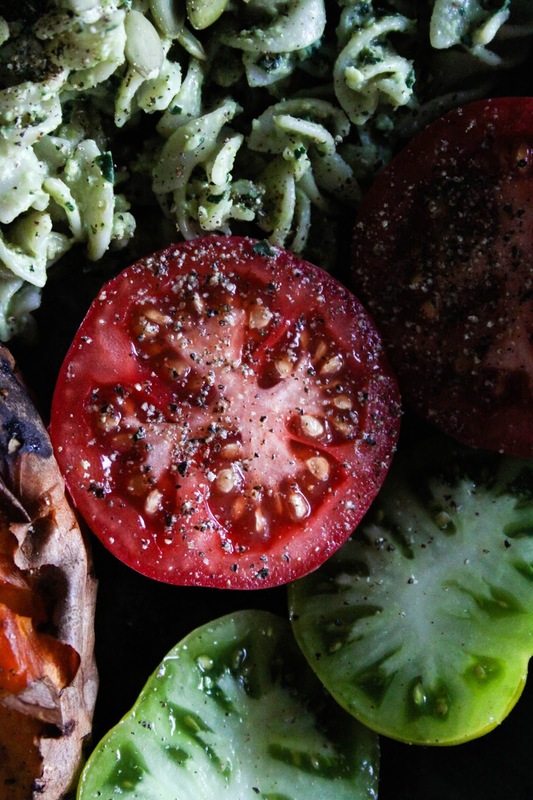 Slice the tomatoes. To make the kale pesto: put everything in your food processor and pulse/process until it begins to get the consistency of pesto. If it's too crumbly, add more water or oil as needed. Adjust according to taste. 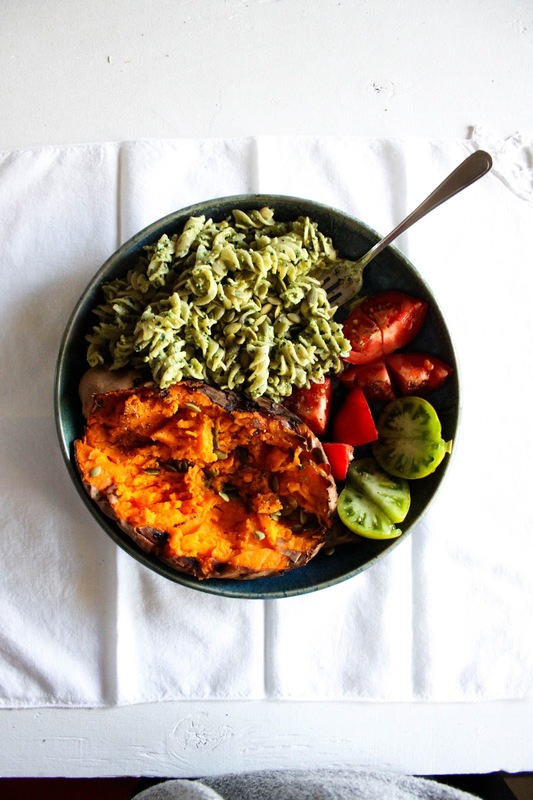 Coat the pasta in the pesto, then serve with the sweet potato and tomatoes, sprinkling with pepper and pumpkin seeds. Voila! Note: you don't HAVE to use that special coconut oil but it literally has magical properties so I recommend you get a jar of it. Otherwise you can just use normal coconut oil and add some lemon juice and black pepper to the pesto. I won't judge. Mmm loving this big bowl of deliciousness! So yummy! Hi Emily! I love the name of this dish! I am a sweet potato lover, they truly are the best! I wash mine, poke a few holes in the potato with a fork, wrap it in aluminum foil, and bake for an hour and 15 minutes at 375°. It will come out a little caramelized and perfect. Bake them on a parchment paper lined cookie sheet to save your oven from any spillage. For some reason the foil never holds in the juices. Go figure? Anyway, this dish is inspiring and has all of my favorite things. Thank you! This sounds wonderful! I am sharing this on pinterest. 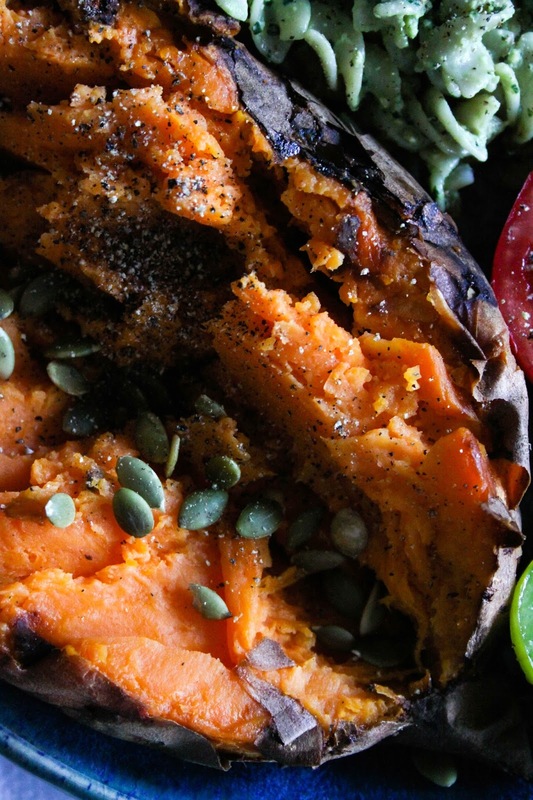 Yup, baked sweet potatoes are the best. They serve them every day in the all-vegan dining hall at my university, so on school days I usually eat at least one a day. I just made this for dinner and it is awesome! I have been vegetarian/vegan for over two years and I tend to fall into a root after a while. I think ur blog has just save me from one. I feel like buying a bunch of bananas and sweet potatoes in my next visit to the farmers market! These will make me never want to eat out if I wanted to get me some baked sweet potato. These look wonderful.